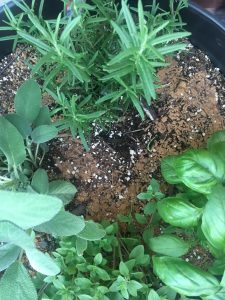 After planting four herbs in a container, I noticed a white growth starting to form on the top of the soil. I believe within a day it turned a weird tan color. Are the herbs safe to eat? Should I toss all the soil and replant? By the way, it’s an organic potting soil I thought would be good for herbs. Picture attached. Thank you! When potted soil develops growth on the surface it is usually what is called a saprophytic fungus. There are several different types of this fungus but the good news is it does not hurt the plants. It is feeding off of the organic matter in the soil and is usually short lived. This fungus usually grows when the soil is kept too wet and the humidity is high. To avoid this it is important to ensure you have good drainage and to only water once the soil has dried out. For good drainage the soil needs to be in a pot with holes. The soil should be placed directly into the pot with no rocks or other items placed in the bottom before the dirt is added. Often rocks are put at the bottom in the belief that it will improve drainage but it has the exact opposite effect. Because of the laws of osmosis, the water in the soil can not drain through the gravel. When you are watering always check the soil first. Stick your finger deep into the soil to see how damp it is. If it is still wet do not add more water. You do not mention where your planter is located. To avoid the fungus make sure it is in a location with good airflow. This will help decrease humidity around the plant which will also deter other pests from attacking your plants. You should be able to scrap off the fungus from the surface. If you make sure the conditions are favourable around the plant it should go away fairly quickly. If you are uncomfortable with it being near food and/or if you do not have good drainage I would repot it. The plants still look very healthy so you should be able to get them growing well.